If you have an electric cooktop and one of the burners isn’t turning on, check the infinite control switch. These are the switches that turn the burners on and off; they also direct how much heat the burners generate. If the infinite control switch is broken, order a new switch (replacement part #WB24T10119 for GE cooktops) and follow these steps to replace it. 1. Unplug or flip the circuit breaker. During this repair, you will be dismantling the cooktop and disconnecting wires. Make sure the cooktop is unplugged before you get started. 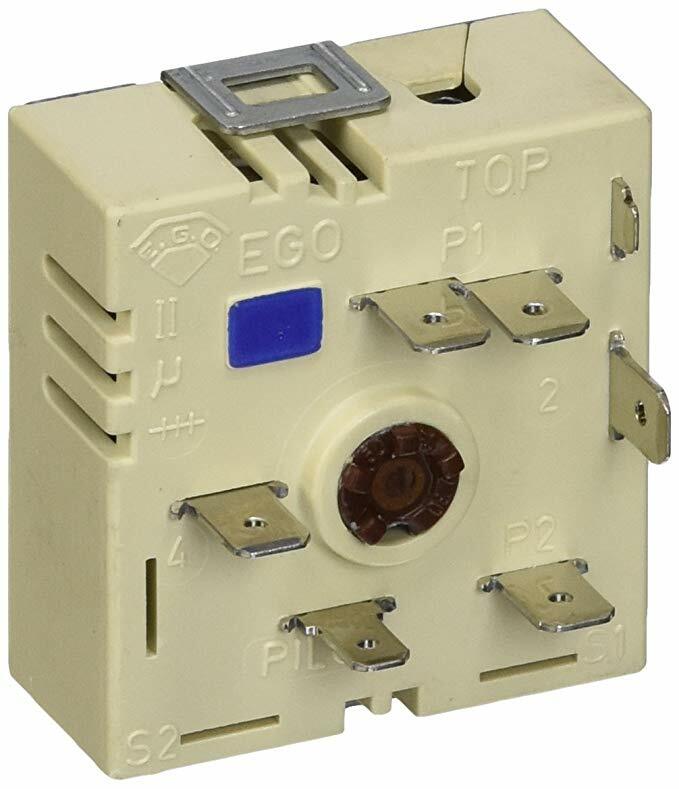 If your appliance is wired directly into your house, flip off the appropriate circuit breaker. 2. Uninstall the cooktop from the countertop. Every cooktop bracket assembly is different. However, every process is straightforward. First, unscrew the brackets you find attached to the underside of your countertop. Then bend the metal so it’s vertically straight and out of the way for when you pull the cooktop out of the counter cavity. Repeat this step for all of the brackets connecting the cooktop to the underside of the countertop. Also, break the foam tape seal along the underside of the cooktop’s perimeter. First, push up on the underside of the appliance to see if the seal is weak enough to break by hand. If the seal isn’t loose, use a razor blade to cut through it. Then lift the cooktop above the countertop cavity. To do this, find two wooden supports that are longer than the gap from top to bottom. Lift the left side and slide the wooden support underneath to hold that side above the cavity. Then repeat with the second wooden support on the right side. Working in the kitchen is much easier than completely disconnecting the appliance and moving it to a new location. Lift the cooktop knobs at the control switches and set them aside. Then remove all of the screws along the perimeter of the chassis to loosen the glass top. Set the screws aside. Use a putty knife to break the tape seal between the glass underside and the top lip of the chassis. Then lift it straight up so don’t catch shaft on the grommets. Carefully set it aside on a flat, soft surface to prevent scratches. 4. Remove the old infinite control switch. Open the switch box inside. Start by lifting up the element above the control box. Shift it aside without laying it on top of the other elements. Remove the three screws holding the bottom of the box cover in place. You may need to shift the insulation aside to find them. Then carefully lift up the top like you’re opening a box lid and swing it open until it’s upright. The top holds the infinite control switch ports. Before you disconnect any of the wires, locate the specific infinite control switch that you need to replace. Do this either by tracing the wires from the malfunctioning element or by consulting your owner’s manual. Once you know which infinite control switch wires you need to manipulate, take a picture of the ports before you start. Then you have a guide you can consult during reassembly for extra help. When you’re ready to continue disassembly, start by snapping off the wire harness at ‘twelve o’clock.’ Then continue to work clockwise around the square mount of the specific infinite control switch. Lower the console once the wires have been disconnected and locate the two Phillips screws on the other side. These hold the actual infinite control switch in place. Remove them. Then lift up the control box top again so you can slide the infinite control switch free of the cover and pull it out. Set the old infinite control switch aside. 5. Install the new infinite control switch. Before you install the new infinite control switch, compare the wire ports and markings to the old one. Make sure both are oriented correctly based on the ‘top’ and ‘bottom’ markings on the switch. While the wire placements should be exactly the same as before, the letter markings on them may have changed. Consult the guide that came with the part to make sure you’re ‘translating’ the port markings to install the wires in the correct positions. You will also have the picture you took earlier for confirmation. Once you feel confident you know how to replace the wires, slide the switch through the interior side of the control box cover. Make sure the orientation is correct. Next, lower the cover while holding the switch in place and reattach the Phillips screws to secure it. Lift up the cover and begin reattaching the wires, starting with the purple wire at twelve o’clock. All you need to do is push the metal ends of the wires into place over the switch’s ports. Continue to reattach the wires, working clockwise through the ports. Once you’re finished, you should have one empty port. Check your picture a final time to make sure your wiring is correct. Close the cover for the final time. Realign it with the holes in the frame for the console and reinstall the three screws holding it in place. Make sure the insulation doesn’t get pinched in the screws. Shift the top element back into position and push it firmly against the posts. Again, make sure none of the wires are pinched. Reseal the chassis edge. Do this by checking the clear tape along the perimeter for any damage. If it’s ripped, torn, or dirty, peel it away. Add a new piece of GE’s clear tape. Repeat this inspection and tape replacement on all four edges of the chassis top. Reseal the underside of the cooktop. Flip the cooktop upside. Scrub the residue from the previous foam tape off the edge of the cooktop. The foam tape needs a clean, dry surface to adhere to. When it’s clean, add new lengths of tape around the four edges. Carefully tap the tape into place without stretching or wrinkling it. Make sure the corners don’t overlap and the gaps between the edges are as small as possible so you can push the corners together and make a watertight seal. Carefully orient the cooktop right side up and with the grommets lined up above the shafts. Lower the glass as evenly as possible so it both lines up correctly and there’s no stress around the shafts. Once it’s fully lowered onto the chassis, press down around the edges to engage the seal. Reattach the screws around the perimeter of the chassis to secure the glass top. Starting from the left, hold the cooktop securely and slide the left wooden support to the side. Lower the cooktop into the cavity. Repeat this process to remove the right support and lower it into the counter. Ensure the cooktop is parallel to the edge of the countertop before pressing it down to seal it to the countertop. Next, reattach the brackets on the underside of the countertop. Bend each bracket into an L-shape with the visible length of the bracket flush against the countertop underside. Line it up with the hole from the screw and reinstall the screw to secure the bracket in place. Make sure each of the brackets is tightened into place. After that, reattach the knobs to the shafts of the infinite control switches. Make sure the markings are oriented correctly to the ‘off’ position. Some of your infinite control switch shafts may look like ‘D’s instead of circles, so orient the post of the knobs to match the shaft as you push them into place. For more appliance repair guides, go to Dan Marc Appliance here. We also have trained appliance repair technicians standing by.